Indeed it is very random! I was actually afraid to tell you that! if you are giving extra spots... I tried to get you more people Bo I'd rather more appreciate all you do!!! Last edited by T Louie (111654346) on Sun Jan 27, 2019 7:27 pm, edited 1 time in total. Thanks for Trying T. but odd that I have over 400 Views Id think it would be set by now but its ok! we will carry on! @Joyce You may take another spot too If you make it in time as your 2nd Seat was due to a 1st to comment. May I take another one too? No scores can repeat in the 14 for a player right? If you someone to take another team I'll take one if I can. 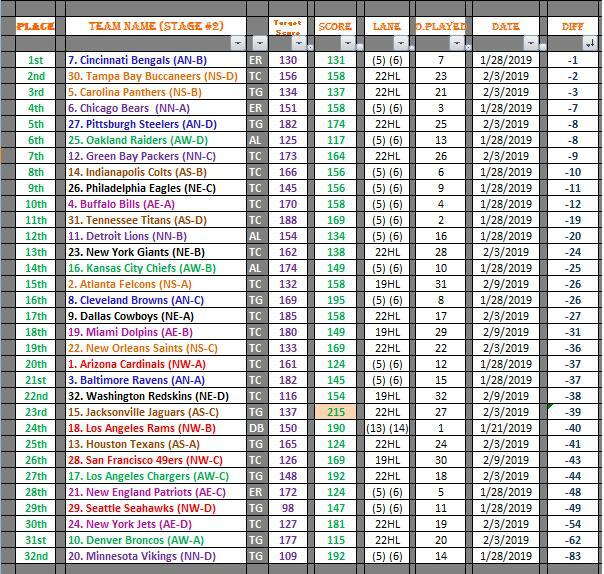 So Far two Spots are still open so you can still pick two teams from Post #2 still. Thank you for the extra spot! Great! Every team is now picked! I'll get things together tomorrow and post stats! Liberty Bo Panda (132500643) wrote: Great! Every team is now picked! I'll get things together tomorrow and post stats! 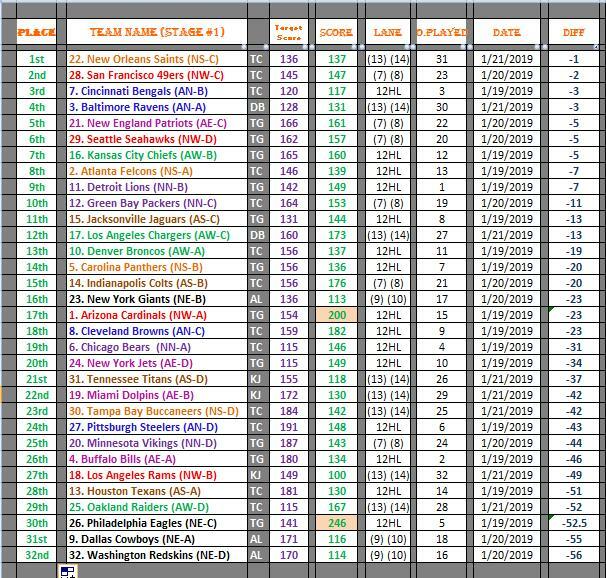 Here are the Score For Everyone that picked...Now I made you all pick 14 but only needed 13 so that is why you do not see your last score picked. I miss counted! But may use that last score in place of a Tie breaker if needed. I will Have round #1 Results up soon! Congrats to...The Eagles won Pinkraine 246k! Congrats to...The Cardinals won T.Louie 200k! So this may be confusing but Ill try to explain this the best I can. 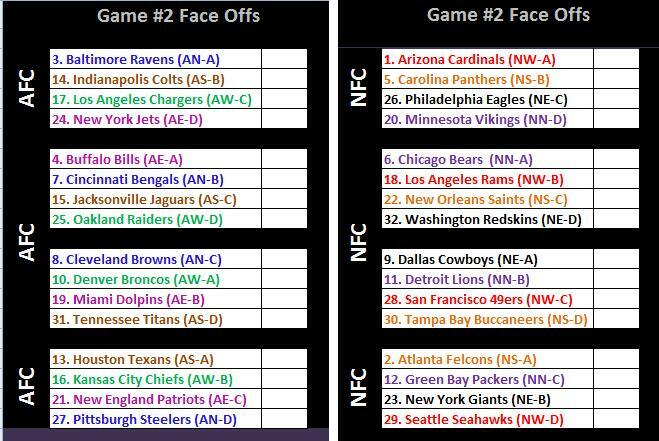 So taking the scores from my post above of Game #1 or Stage #1....I put them into your face offs Per Conference AFC and NFC....As Game #1 was based on As, Bs, Cs, Ds...On the left side shows how each face off went...1st got 3 points 2nd 2 and 3rd 1...BASICALLY if you watch NFL Football this is 3 Football Games in one game I should say...So As the Ravens won...Lets just say Ravens vs Broncos would be a final score of -3 to -19 since we are trying to get closest to 0 Ravens would win...Then Ravens vs Bills -3 to -46 Ravens would win again..You get the Idea its like they are playing three games at once the higher up you are you win more points to move on to the Play Offs...We have 5 total stages of this. As the 5 rounds move on your player can get a Max of 15 points in the Win Column...and to break a tie breaker your total Distance from Zero for all 5 rounds will be added together. 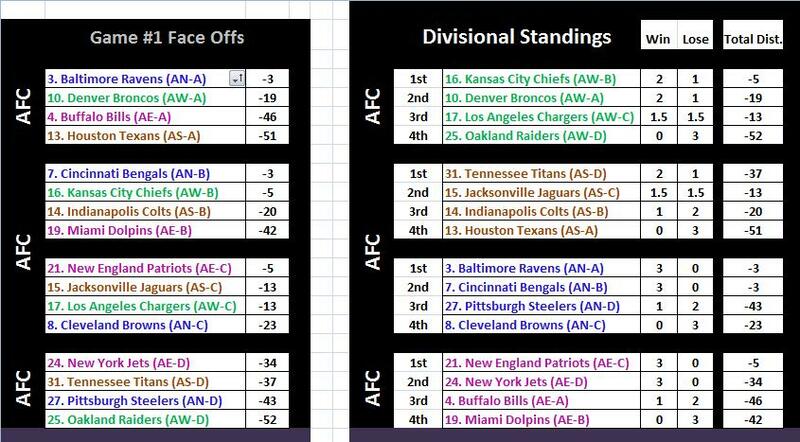 You will face every team in your conference AFC or NFC in the 5 rounds. But you want to be in 1st place in your colored division to remain qualified for the play offs! 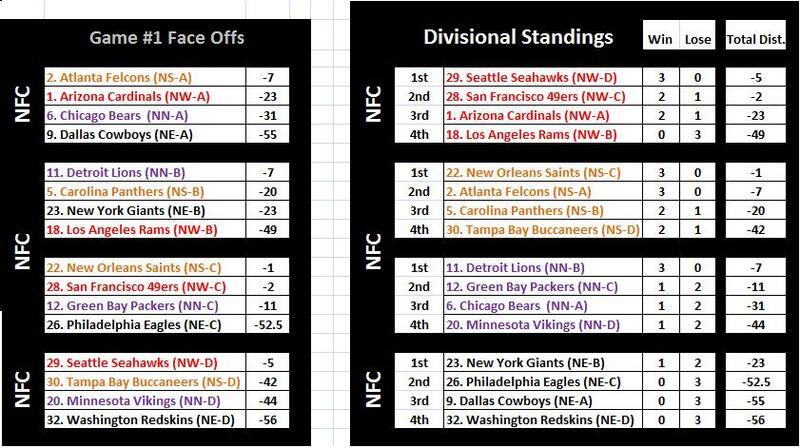 Oh and Right Side is the Standings Per Division! Any Questions Ask I hope to get everyone fallowing along! One Highlight of this round was a 215 for the Jaguars 215k to...Joyce! Alright everyone! 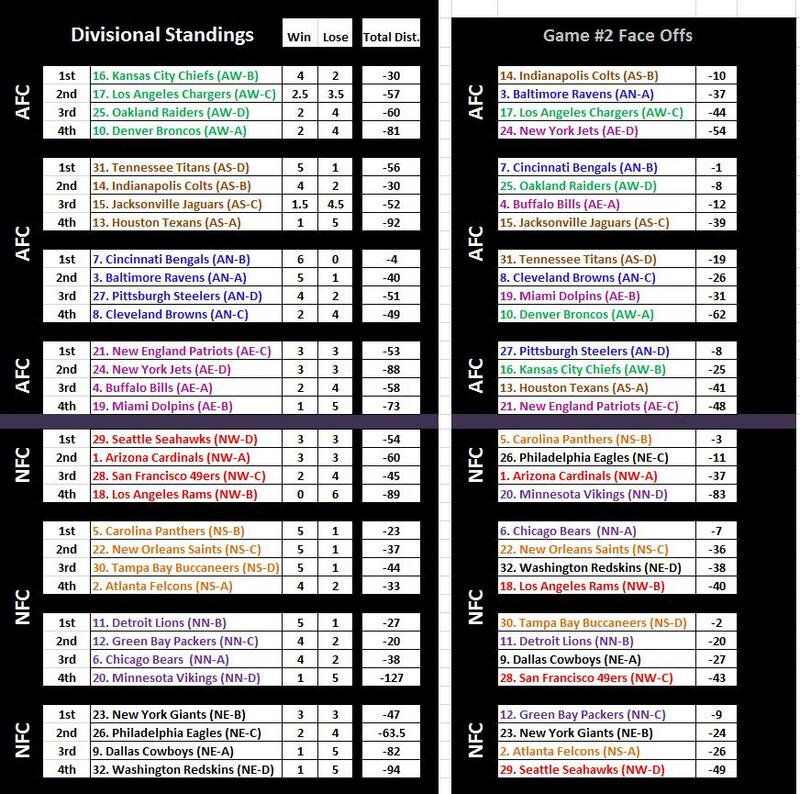 This is the Current Standings after the End of Stage #2....The Left Side is the Standings per Division over all the right side was the Stage #2 results on Face offs! We have now finished Stage #3! So More Results rolling out most likely tomorrow. Irish Bo is back! You look fabulous! Thanks so much for the update Bo!! Take your time!!! Life & bowling come first! !